Known for their impressive strength and reliability, the 2019 Ford Escape and the 2019 Honda CR-V bring the ideal blend of convenience and thrill. But which of these pavement-treading monsters does it best? Check out this overview of the 2019 Ford Escape and 2019 Honda CR-V for more details on how these vehicles compare in engine performance. On most trims, the 2019 Escape and the 2019 CR-V bring similar engine horsepower and torque offerings, but the Escape dominates in towing power. As you move up the Escape and CR-V lineups, it becomes evident which vehicle packs more power, with the Escape Titanium boasting 66 more horsepower and 98 lb.-ft. more torque than the CR-V's highest trim level. The Escape also holds more than twice the maximum towing capacity of the CR-V, making it the obvious choice for outdoor enthusiasts. Keep reading for a more in-depth breakdown of each vehicle's engine offerings. 3,500 lbs. Max. Tow Capacity 1,500 lbs. The standard engine packages offered by the 2019 Ford Escape and the 2019 Honda CR-V are fairly similar. The CR-V's base trim level, the LX, comes standard with a 2.4-liter i-VTEC inline 4-cylinder engine that puts out 184 horsepower and 180 lb.-ft. of torque. 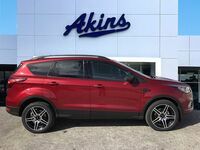 The Escape S’s standard 2.5-liter DOHC 4-cylinder engine delivers just slightly less strength, giving 168 horsepower and 170 lb.-ft. of torque. All other trim levels on the Honda CR-V come fitted with a 1.5-liter turbocharged VTEC 4-cylinder engine, which is only a bit more powerful than the first, tapping out at 190 horsepower and 179 lb.-ft. of torque. The Escape SE and SEL offer a 1.5-liter turbocharged 4-cylinder engine, which delivers up to 179 horsepower and 177 lb.-ft. of torque. 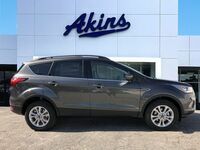 At the end of the 2019 Escape lineup, the Escape Titanium blows the CR-V out of the water with a 2.0-liter turbocharged 4-cylinder engine that cranks out 245 horsepower and 275 lb.-ft. of torque. With their standard engines, the base-level 2019 Ford Escape and 2019 Honda CR-V both deliver a maximum towing capacity of 1,500 lbs. Despite getting the upgraded 1.5-liter turbo engine on higher trim levels, the CR-V's absolute maximum towing capacity lies stagnant at 1,500 lbs. 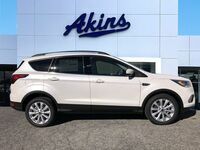 With the Escape SE and SEL’s standard 1.5-liter turbo engine, drivers can haul up to 2,000 lbs. The Escape Titanium’s 2.0-liter turbo engine cranks out more than double the CR-V's hauling power with a maximum towing capacity of 3,500 lbs.